While I still haven't read this author's previous work, the Article 5 trilogy, it has been on my tbr shelf for some time now. 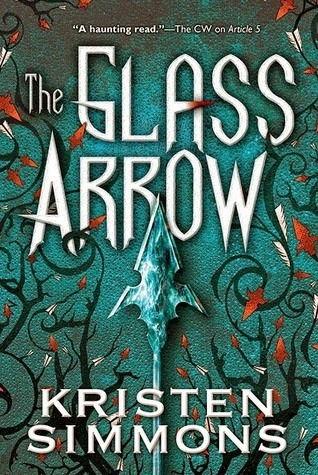 The Glass Arrow however, sounds even more like a story I could really get into! I mean don't get me wrong, I love a good quality dystopian as much as the next person, but this one ^^ is a dystopian with sci-fi and fantasy elements. Yeah!! The fact that this dystopian world targets females already has me on the edge of my seat - and all I've got to go on is the synopsis. If the actual book follows that same trend, I think we're in for one hell of a ride! What do you think about The Glass Arrow? I just requested this on Edelweiss, it sounds so good! I haven't seen this one yet, but you're right it definitely sounds intriguing. I'm very interested in how she'll manage since she got caught. It's terrifying to think of being hunted specifically for being female. Thank you so much for sharing! Jaclyn @ JC's Book Haven. Looks like a fabulous book <3 And by the way, your blog looks fabulous!! My goodness, I love it. The design is absolutely awesome! I don't know if I could deal with Glass Arrow though :/ It's a topic I sometimes have trouble with, and it would depend on how it's handled. I'll definitely keep an eye out for the reviews though!